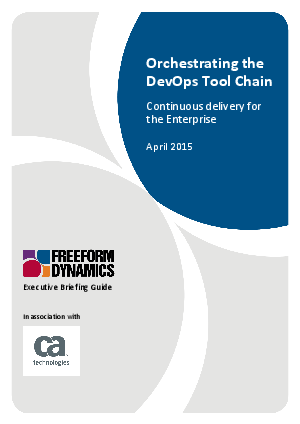 Freeform Dynamics Executive Briefing Guide - Orchestrating the DevOps Tool Chain: An enterprise-level approach to continuous delivery. Dale Vile says that business stakeholders are increasingly looking for faster and more frequent delivery of high-impact, high-quality output from IT teams. DevOps is an approach designed to enable the rapid and continuous delivery of value to the business to support the needs of the digital world, he adds. Open source software tools can help organizations adopt this DevOps approach but can cause efficiency, complexity and scalability issues, so Dale believes it is helpful to create a consistent orchestration layer using an enterprise class release automation solution.